After researching this article, we're not even sure we're allowed to use the Twitter bird logo at all, so we're just going to start this off with some pretty, colored, non-Twitter birds. Like most companies, copyrights abound at Twitter. Some companies have internal stylesheets that reflect how they want you to speak about the company, and how images are displayed, and even how you can reference another business or human — Twitter has public ones. As we all know, if you put something out there publicly, on some level misuse and abuse will occur. When it comes to Larry the Twitter bird, however, things get even more serious. After all, “Twitter is the bird, and the bird is Twitter,” Twitter wrote on their blog after their 2012 rebranding. Twitter now goes by a symbol (kind of like the late Prince). So, here are the rules, if you're ever brave enough do something with their logo (which you may not be after getting through this list). Blue or white — and that's it. Don't even think of making it red or green for Christmas — Larry doesn't believe in Santa Claus. Don't bump the bird up against anything else. Twitter requires you to "maintain a safety space that equals 200 percent the size of the square around the bird." (Personal space, anyone?). Don't suggest a relationship. Unless you are affiliated with Twitter in any way and have their permission, don't even suggest Twitter has anything to do with you. Don't put your logos near each other, and don't add it to contest pages (this can suggest that Twitter endorses it). Don't animate the bird. Larry doesn't fly — so don't try to get the guy to flap his wings! Don't use any ancestors. Twitter requests that you also forget any and all other logos and birds previously in use by Twitter. Do not publish them ever — only use the most current version of the Twitter bird. Don't put the bird on the cover of your book. Even if it's about Twitter, don't use the logo. Don't emphasize Twitter's play in your promotion. Don't make Twitter's bird larger than your own logo. Don't use the bird as your background. 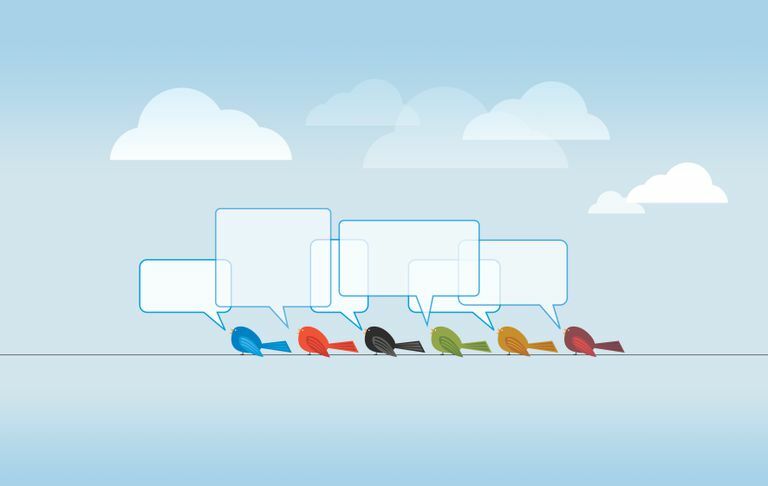 They know you love Twitter and all, but one bird is enough, and it's right in the top-center of your Twitter homepage. Don't create your own "Tweet" and "Follow" buttons. Twitter says that unless technically necessary, you should be using the buttons they've created for you. And if you have to, use this version of the Twitter bird. It may seem like micromanagement, but if people go around posting old versions of their logo, the internet will get confused. If people start using Twitter's logo within their own logos, Twitter apps will start getting more downloads than the native app. In short, they're simply protecting their brand. We don't know if they really follow up and scold people (except, probably, businesses-making Twitter apps) but the rules are in place for a reason. Equal sizing. In print, you're allowed to use the Twitter bird next to your @username or say "follow us/me on Twitter." However, the logo must match the same size as your # or @ symbol. Attribution. If you want to source a Tweet in print, you can do so by formatting it to look like a Tweet and putting the small Twitter bird logo next to the @username. The bird should be the same size as the text. Online, just embed the Tweet.